Happy Tuesday, friends! Recently one of my dear nieces asked me what I called my decorating style? I’ve never been able to describe it accurately until now. Guess what it’s called? Maximalism! This week I was finally able to find an official name for my decorating style. I’m a maximalist! So what is maximalism? According to Wikipedia, maximalism is “a reaction against minimalism, is an esthetic of excess and can be summarized as a “more is more” as opposed to a “less is more” philosophy.” I’ve always joked about more being more and now I have the perfect word for it! For example, the more crystals a chandelier has, the better! And the more chandeliers, the better! Here is a picture of our kitchen and my double chandelier fantasy turned reality…. So, now as a self proclaimed maximalist, I am at liberty to put chandeliers in every nook and cranny of the house, including closets, bathrooms and outdoor areas. I have a few more in my stash, so now there is no need to exercise restraint. And why should these beauties hide in the basement when they could bask openly in their sparkly crystal glory? I’m thinking The Biltmore House on a smaller scale. Or perhaps Versailles? 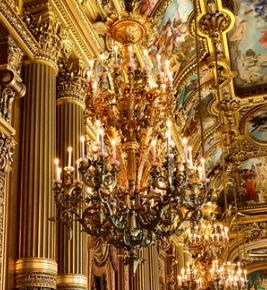 This is a photo taken by my daughter-in-law inside the famous Palace of Versailles. You can see my son knows me all too well. (He’s pointing to one of the gorgeous chandeliers.) They sent this picture to me while in Paris last week knowing I would go crazy for it! The chandelier came with most of the crystals intact, but a few were missing so I matched the missing pieces with ones from my stash. And I added the large crystal ball on the bottom for a bit of extra pizazz. For me, the more crystals the better! Maximalism at its finest! Oui, Madame! I’ve not yet been to Paris, although it’s on my bucket list. Perhaps for our next anniversary? I can’t wait to see all of this in person!! Photo credit goes to my lovely son and daughter-in-law, Chase and Brie. Isn’t this stunning? What opulence! Get a load of those columns and molding! Sigh….They toured Versailles and the Opera House on this trip. My daughter-in-law’s company is headquartered in Paris so she must go quite often for work and my lucky son gets to go, too! Here they are in a selfie. And here is my handsome older son, Chase, in front of the Opera House. He said it was their favorite trip thus far to Paris. I’m beginning to suspect my son is a Maximalist too. I am perfectly fine with that. So, tell me. What is your decorating style? I’ve always known minimalism is not for me and I’m delighted to have a legitimate name for my style and not feel guilty about it! Maximalism? Yes, please. It can also apply to flowers! New Coat Hanger in the Butler’s Pantry!